Obituary for Virginia A. 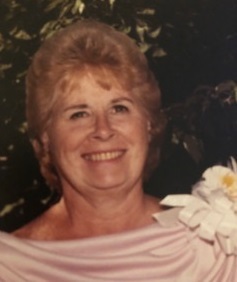 ("Ginny") Lieblang | Arthur F. White Funeral Home, Inc.
Lieblang, Virgina “Ginny”, 94, longtime Amityville, NY resident passed away while residing in North Carolina. On February 6, 2019, she was reunited with her late husband, John and their cherished children Keith and Jill and grandson James Garvey. Registered Nurse and supervisor at Our Lady of Consolation Nursing Home, Amityville and NYS Licensed Funeral Director. Beloved mother of Virginia Deucher (the late James), Gail, Donna, John, Grace Tahlor (Barry), Dean, Dawn and Mary J. Adored grandmother of 9 grandchildren and great grandmother of 12 great grandchildren. Visitation Sunday, 2-4 and 7-9 pm at Arthur F. White Funeral Home, Inc., 315 Conklin Street, Farmingdale. Funeral Mass Monday, 10:30 am at St. Martin of Tours RC Church, Amityville. Interment following in the family plot at Trinity Cemetery, Amityville. In lieu of flowers donations to the Alzheimer’s association or your favorite charity in Ginny's name would be appreciated.